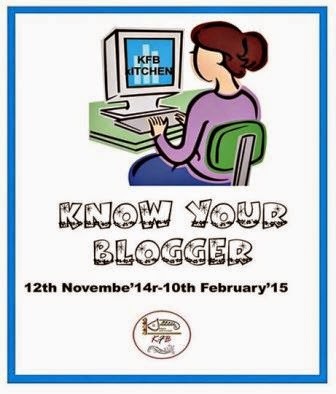 This is week 2 of Kolkata Food Blogger's ongoing event, " Know your Blogger", what I have mentioned in my last post. I have introduced another Food Blogger and co-member of my foodie group KFB. You can check our facebook Fanpage here. 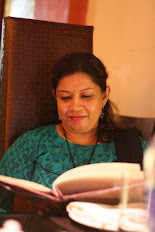 So, today I'm now going to introduce you another blogger from Kolkata and co-member of my group, Jayati of Jayati's Food Journey. She is an extremely gorgeous lady with a very pretty smile. After holding a full-time job, she blogs quite often. Her recipes are very easy-to-follow for anyone as she posts step-by-step pictures for most of her recipes. Even though we are in the same city, I haven't got any opportunity to meet her yet. She has an enormous lists of traditional and experimental Bengali recipes along with many continental recipes on her blog. I'll recommend my viewers to check her blog at the earliest. Last year too we have organised the same event and I had introduced her here and recreated her Prawn Dumpukht recipe. This time I made her Dum Paneer Kalimirch and Orange Pudding following her recipe. 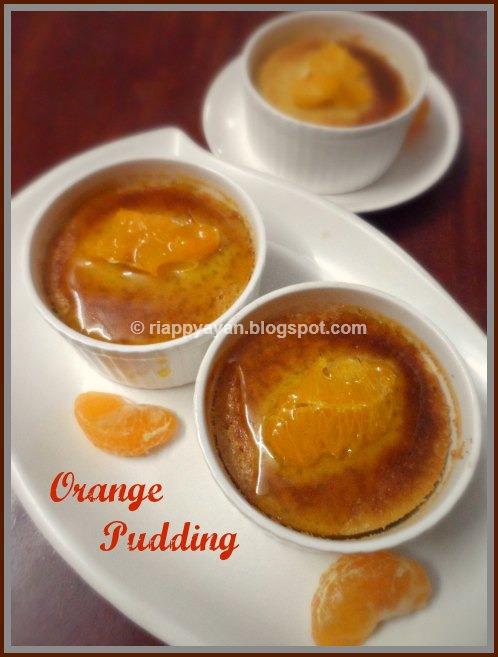 Today, I'll share her Orange Pudding recipe, which I totally followed her recipe, only reduced the amount to make 4 servings. 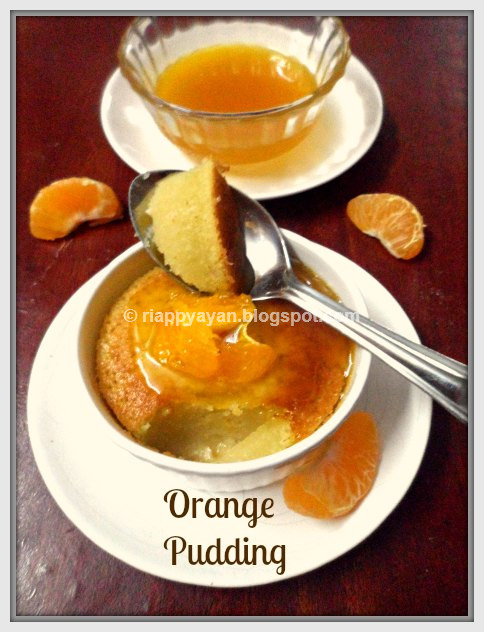 I made an extra thick Orange syrup to serve over the pudding, which made this dessert more heavenly. I'll share her Dum Paneer Kalimirch recpe in later post. 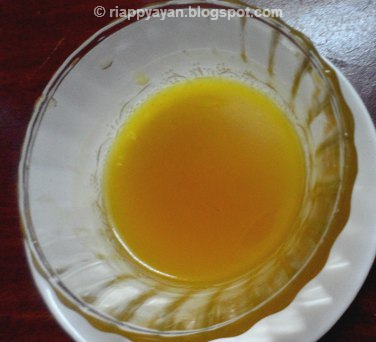 Make orange juice from 2 oranges. Separate the egg yolks and egg whites. In a wide bowl, beat the egg whites with a mixer for 3-4 minutes in high speed. Then lower the speed and beat them until they are firm. This is most tedious part of this recipe, rest is like a breeze. Keep aside. Preheat the oven at 180 degreesC. Grease your bowl or ramekins with little butter and set aside. In a bowl take butter and sugar. Mix till well combined. Add the orange zest and flour. Mix well and add 4-5 tblsp. of orange juice. Now add the egg yolks. Mix and add milk gradually to make a smooth batter. Then add the egg whites into the batter and slowly fold it to the batter. Pour the batter into the prepared baking bowl or ramekins. Bake at 180 degrees C for 25-30 minutes or until pudding is set. Just do a toothpick test, if a toothpick inserted in the middle of the pudding comes out clean, then it's done. After it was done, I put them under the grill for 5 minutes to make the top little brown. Heat a pan, add the butter and sugar. Cook till the butter melts and is well combined with the sugar. Add the remaining orange juice and honey. Mix and cook till the sauce thickens a bit. Add cornflour and remove from heat when the sauce thickens like a syrup. Orange Sauce/Syrup is ready. Pour over the pudding just before serving. 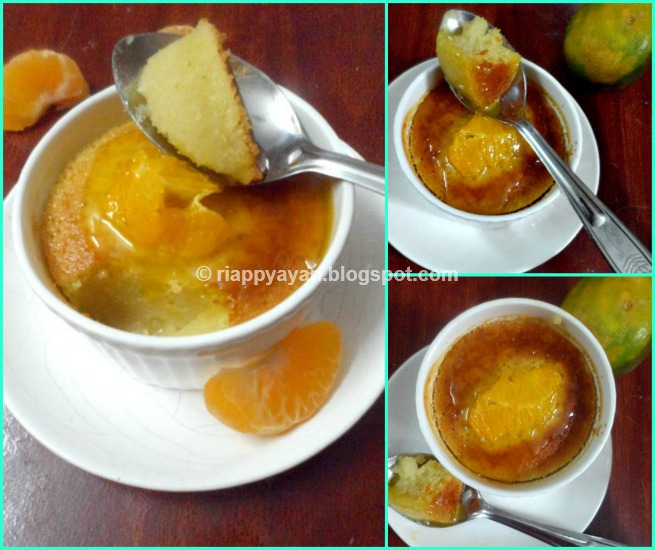 Enjoy this heavenly dessert with your family in leisure....I want to thank Jayati for sharing such a yummy recipe with us. 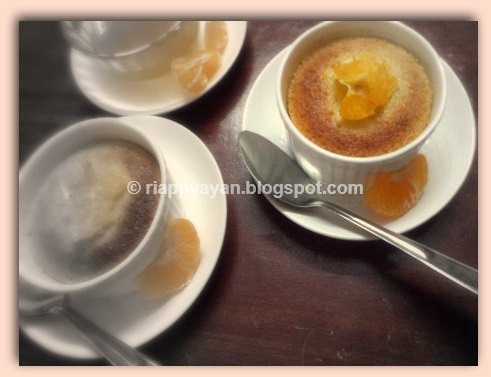 an unusual dessert and looks so refreshing. Bookmarking it.